YOU HEARD IT FROM COMPANY SEVEN FIRST! Meade Instruments has just pulled way ahead all the competitors in the optics manufacturing world by developing their newest "ACF/IA" series telescopes. Yes the new "ADVANCED COMA-FREE/INSTANT APERTURE" telescopes provide dramatic increases of aperture, yet Meade has packaged these increases into unprecedentedly compact and narrow forms. 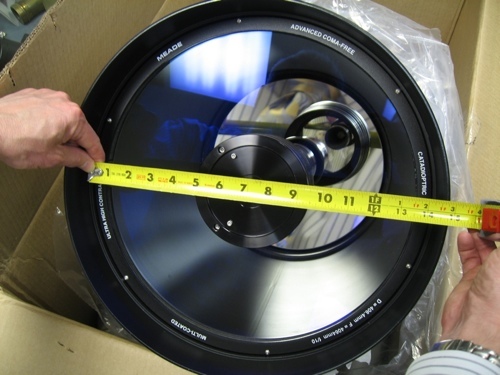 For example look at the new Meade telescope optical tube assembly just evaluated by Company Seven yesterday. The telescope appears to be a 14 inch aperture (355.6mm) system with a focal length of 3,556mm. But the Corrector Lens Retaining Ring reveals it is in fact "D=406.4mm F=4064mm"; so this is really a 16 inch f/10 telescope packaged into a form as compact as the 14. Just imagine this telescope shown below should provide about 1.3 times the light gathering power of a traditional 14 inch telescope, and yet this telescope optical tube assembly is no larger and weighs no more than a conventional Meade 14! Above: Corrector Lens Retaining Ring of Meade 14" OTA, SN 107674 undergoing acceptance evaluation at Company Seven. Ruler shown proves this is a 14" OTA, but it is clearly labeled revealing it contains Meade's new 406.4mm ACF/IA optics inside. This should help them tremendously over thier competition!! Plainly there is some weird Lorentz contraction correction I have always omitted when measuring apertures - mind you I did once have a Meade 8" SCT that was f/6.3 - f/10 selectable - Said 6.3 on the corrector ring but the mirror was f/10! Millimeters, inches, focal ratios, tape measures—you know how numbers confuse me. Could you please just convert this to furlongs? I'm trying to figure shipping costs on this 'scope. How many barleycorns does it weigh, please? Wow! Virtual Aperture ... wotta concept. You should be able to sell a ton of those. don't remove the corrector! You see, in this new advanced line of telescopes, they use smoke and mirrors! You don't want to let the magic Meade smoke out. I think the special smoke alters the velocity factor of the medium that the light has to propagate through, effectively lengthening the path and focal length. The secret is increasing the aperture; possibly using the hidden dimensions that string theory predicts.